This stylishly renovated self-catering holiday apartment for 6 to 8 people has three large bedrooms. Two 400 years old servant houses have been merged into one. During the renovation the original features were restored and many natural materials were applied. The cottage (gîte) is equipped with all modern comforts and accessible for people who have difficulty walking or who use a wheelchair; on the ground floor there are no thresholds and all doors are 77 cm wide. This gîte has a private driveway for your car and a large private garden with furniture. On the ground floor (72 m2) is a fully equipped kitchen with refrigerator, freezer, stove with four burners, extractor fan, coffee maker and electric kettle. The terrace on the southeast side is directly accessible from the kitchen. The second terrace, which faces west, is accessible through the sliding doors in the living room. In the living room there is a large dining table, a lounge area and an old chimney with fireplace. The spacious bathroom has a shower, a ceramic sink, a 50 cm high toilet and there are brackets attached to the wall. Furthermore, there is an additional shower for someone who is disabled or has trouble walking. The first bedroom has two 50 cm high single beds and a mattress of 90 x 200 cm. On the first floor, where tobacco leaves used to be dried, there are a landing and two bedrooms of 25 m2 each. One bedroom has four single 90 x 190 cm beds. In the other bedroom is a double bed (140 x 200 cm). On the landing is a cot. 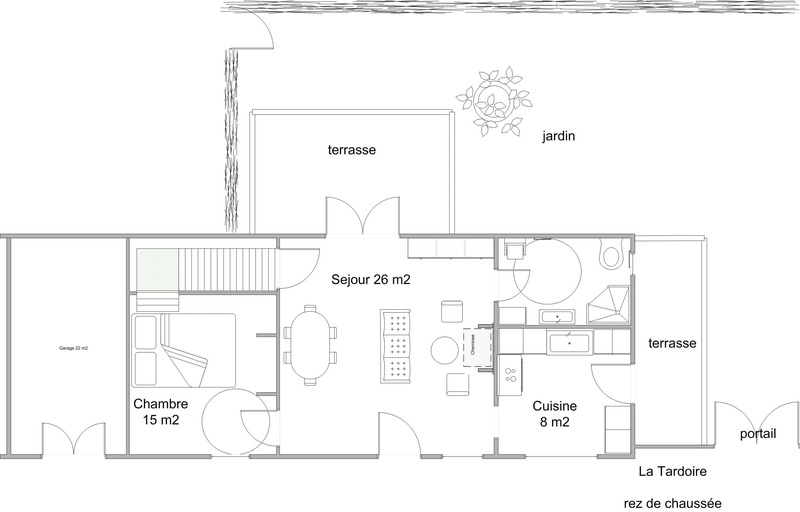 Click the floor plan to enlarge.